Trifecta Gold Options Eureka Dome from Pacific Ridge Exploration Ltd.
April 26, 2018 - Trifecta Gold Ltd. (TSX-V: TG) (“Trifecta” or the “Company”) is pleased to announce that it has signed an option agreement under which it can acquire a 70% interest in the road accessible Eureka Dome property from Pacific Ridge Exploration Ltd. (TSX-V: PEX) (“Pacific Ridge”). The property is located in the Dawson Mining District of west-central Yukon, Canada, and consists of 156 mineral claims. It borders Trifecta’s Eureka property to the east and covers Eureka Dome. The Eureka Dome property is located in an area of active placer mining in west-central Yukon and is accessible by road from Dawson City. It is approximately 55 km from White Gold Corp.’s Golden Saddle discovery. Pacific Ridge staked the Eureka Dome property in 2009 to cover the tributaries of some of the major placer gold bearing creeks within the southern part of the Klondike Goldfields. Pacific Ridge has performed prospecting, geological mapping and rock and soil sampling on the property. Soil sampling in 2017 identified a multi-element soil anomaly known as the NW Ridge Anomaly. This approximately 2 km wide by 750 m wide anomaly is defined by strong pathfinder element response, especially arsenic, antimony and mercury. It is located on the western edge of the property and adjoins a cluster of strongly anomalous gold and very strongly anomalous lead values found on Trifecta’s Eureka property. Stream sediment samples from creeks draining the NW Ridge Anomaly have returned values ranging from 360 ppb to 2,190 ppb Au. No drilling is recorded on the property. This summer’s work on the property will include detailed surface exploration, with a focus on the NW Ridge Anomaly, which could comprise prospecting, geological mapping, soil sampling and silt sampling. If results warrant, this work should be followed by trenching and ultimately, drilling. Trifecta’s road accessible Eureka property is located in the legendary Klondike Goldfields, 110 km by road south of Dawson City. It lies directly on the proposed haulage road for Goldcorp’s Coffee Deposit, between Klondike Gold Corp.’s Klondike project and White Gold Corp.’s Black Hills property. Eureka is underlain by metasedimentary rocks belonging to the Yukon-Tanana. The property straddles the headwaters of Black Hills and Eureka creeks, two of the most productive placer creeks in the southern part of the Klondike Goldfields with reported gold production totaling more than 200,000 ounces between 1978 and 2017. There are five known mineral showings on the Eureka property, three of which are drill-ready targets, and all of which appear to host gold in a series of gently to moderately dipping breccia zones that have been partially delineated by mineralized trenches and drill holes. Historical work on the property includes: mapping; prospecting; soil sampling; hand and mechanized trenching (5818 m in 38 trenches); ground and airborne geophysical surveying; reverse circulation (RC) drilling (4174 m in 41 holes); and diamond drilling (1188 m in 8 holes). Highlight results from drilling include a bulk tonnage intercept of 0.59 g/t gold over 18.3 m, and a high grade intercept of 9.99 g/t gold over 1.5 m.
The Eureka property hosts an 8 km long by 2.5 km wide northwesterly-elongated gold-in-soil geochemical anomaly that is open to extension in most directions. Anomalous values range from 20 to 762 ppb gold-in-soil. Much of the property has not yet been sampled and very limited prospecting has been done in the vicinity of the strongly anomalous gold-in-soil locations. The Eureka property is favourably located, but has received surprisingly little drilling and trenching considering the size and strength of its soil geochemical anomaly and the abundance of placer gold in creeks draining the property. Placer mining is ongoing in the area, and gold recovered from the upper reaches of both Eureka and Black Hills creeks is described as a mixture of coarse and fine, generally angular grains, with some grains containing inclusions of dark quartz while others are attached to larger white quartz fragments. All of these attributes suggest the gold is near source. Future work should include additional grid soil sampling followed by excavator trenching and/or track-mounted RC or rotary air blast drilling and diamond drilling. 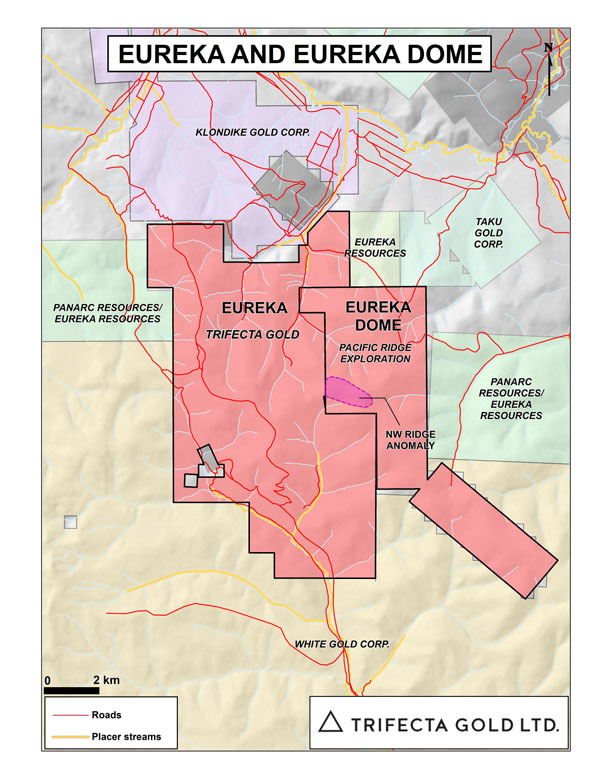 Additional information on the Eureka and Eureka Dome properties may be found on Trifecta’s website at www.trifectagold.com. an additional $100,000 on or before December 31, 2022.
an additional 300,000 shares on or before December 31, 2022.
an additional $1,500,000 on or before December 31, 2022. Once fully vested, Trifecta and Pacific Ridge would enter into a Joint Venture agreement to continue exploration of the property. Should either party’s interest be diluted to below 10%, it would be converted into a 1% NSR. Technical information in this news release has been approved by Heather Burrell, P.Geo., a geologist with Archer, Cathro & Associates (1981) Limited and a Qualified Person for the purposes of National Instrument 43-101.